Have you ever imagined what it would be like if one of your body parts starts moving without your control as if it has a life of its own? Sounds like from a horror movie, right? But there's actually a rare medical disorder that allows this to happen in real life. 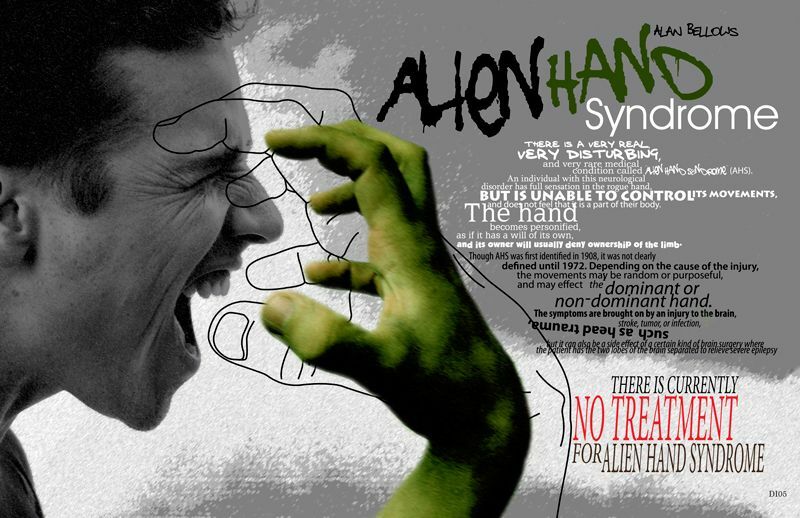 Probably one of the rarest and weirdest disorders out there, this neurological condition is called alien hand syndrome. This bizarre condition causes uncontrollable movements of the hand. The movements range from harmless acts such as picking up random objects, to extreme ones where the patients have to restrain their rogue hand using their normal hand. The alien hand syndrome was first recognized by German neuropsychiatrist Kurt Goldstein in 1908. The patient was a woman recovering from a severe stroke. She was right-handed, and it was her left side that has been most affected by the stroke. While recovering, she told her doctor that she can't control her left hand anymore. At first, they considered her psychotic, but further research by Goldstein figured that the woman's symptoms were real. It is thought that the alien hand syndrome is caused by brain trauma. The primary motor cortex was isolated from the premotor cortex. Hand movements are controlled by the primary motor cortex. As of now, there is no known treatment for this condition. Patients deal with it by keeping the alien hand occupied.